Sale-A-Bration Rub-on's - Love 'em! Today's the last day to place your Sale-A-Bration order. Purchase $50 and receive a free product from this catalog. Contact me at dostamping@yahoo.com to place your order before it's too late! 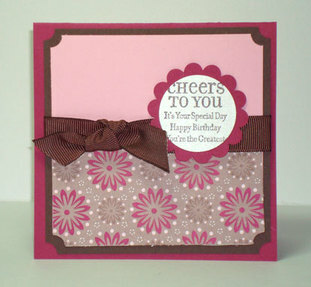 Here's a couple of Sale-A-Bration samples that my downline Laurie did at her stamp camp. Didn't she do a nice job. 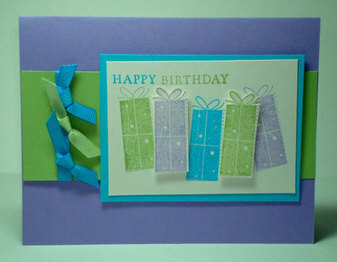 My camera wasn't able to capture the colors properly on her Birthday Whimsey card #111401. It's actually Orchid Opulence, Green Galore & Tempting Turquise. The next card uses the Lots of Thoughts set #111403 and the cute Berry Bliss paper, plus Chocolate Chip, Purely Pomegranate & Pretty in Pink. I like the way she used the ticket corner punch in the four corners...cute! Thanks Laurie!